Thanksgiving at Nanny’s house. Mama is standing and holding me. I am eighteen months old. My older sister, Gwenny, is sitting at the head of the children’s table. I stood watching as she dropped spoonfuls of dumpling dough into the boiling water. I now own the dumpling pot used by my husband Tom’s grandma Schadi and I think of her every time I beat that stiff dough and drop the dumplings into the boiling water. That was the Thanksgiving that Tom and I rode the Greyhound bus all the way from Dallas to Chicago. Tom was in the army, stationed at Fort Sam Houston in San Antonio for his medical training. He called and asked me to meet him in Dallas to take the bus trip to Chicago for Thanksgiving with his family. The bus took all night and half of the next day to reach Chicago. We arrived in an empty downtown on Thanksgiving afternoon. Tom didn’t tell his folks that we were coming; he wanted to surprise them. We walked down the gangway of his parent’s home and knocked on the back porch door. I can still see his mother in her flowered apron standing at the sink, looking through the porch windows at us in complete shock, seeing her soldier son home for the holiday. This time of year, with all of its celebrations and special dishes, reminds me of so many of the strong, wise women I have known through my life. 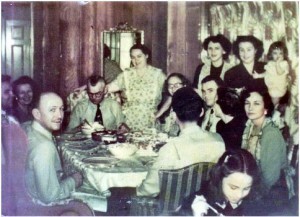 My grandmother, (my father’s mother) always held Thanksgiving dinner at her large, beautiful home on top of a hill. My family, all the aunts and uncles and 16 cousins, gathered together every Thanksgiving. It was a short walk for us, as we all lived within shouting distance of each other. Nanny insisted that the meal be served at straight up 12 noon. The grownups sat in her formal dining room and the kids sat at card tables in the living room. As children grew into young adulthood they could graduate to the adult table. Nanny always served two dressings: cornbread and oyster. The oyster dressing was part of her Virginia heritage. No one ate the oyster dressing except Nanny and my dad, but every year her oyster dressing made its appearance. For dessert, there would be pecan pie made with the nuts from our own pecan trees and Nanny’s dark, luscious Irish chocolate cake. After the meal, the adults would sit at the card tables in the living room and play the domino game, 42. All the cousins would play in Nanny’s huge yard, swinging on grapevines across the creek that separated her house from my two uncle’s houses, or gathering up huge piles of leaves to jump in. Sometimes, we could convince my dad or our Uncle Bill to take a few of us to our farm to go horseback riding. But always, in the evening, we would gather again at Nanny’s to eat leftovers and sing Christmas carols. Thanksgiving night was the official beginning of the Christmas season for us. My husband, Tom’s family always had Thanksgiving dinner at night. It was an elegant affair with candlelight and a fire roaring in the fireplace. We would drive to his mom and dad’s house in Chicago (one time through a blizzard) in time for the ubiquitous pitcher of Bloody Marys. Tom’s mother made her stuffing (not called dressing in the north) with day old Italian bread, stock from the turkey giblets with sautéed onion, celery and raisins soaked in rum. Thanksgiving was accompanied by lots of wine and always champagne with the turkey. Dessert was followed by a snifter of brandy, Tia Maria or Dram Buie. After dinner, we would bundle up for a walk in the neighborhood, Tom smoking one of his dad’s pipes, the smoke curling into the cold, night air. This year, our daughter, Julia, is having Thanksgiving at her house. She and her husband, Chad and their two children will no doubt start their own Thanksgiving traditions. The talent and hard work of many wise and wonderful women will live on in this new family and their new traditions. For those of us who are deeply forgetful, we may not remember every one’s name at the Thanksgiving table, we may no longer remember the recipe for the family’s traditional sweet potato pie, but we do remember what it feels like to be part of a family; to be loved and to love. We remember the smells and the taste and the feel of Thanksgiving. We remember these things not with our mind, but in our heart and in our soul.